In our increasingly scattered and diverse digital world, in which everybody marches to their own drummer, the Tiger Wood’s apology last Friday morning was one of those exceedingly rare TV events that turned into a communal experience shared by billions of people around the country and the world. Every major network ran it live like it was the President of the United States announcing a major international incident. If you really think about it, it was theatre of the absurd. People across America gathered in their offices paying rapt and occasionally mocking attention to this: a golfer saying he was sorry for failing to control his sexual impulses. Yeah, I know it wasn’t just a golfer. Every time I think of Tiger’s infidelities I flash on that Nike commercial of kids saying, “I am Tiger Woods.” He actually did set himself up as a role model. And he happens to be the greatest athlete of our time. But it was still a golfer apologizing for screwing around. Considering the massive televison audience alone, we have definitely plowed new ground here. 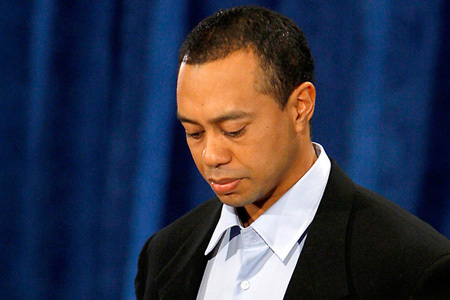 Tiger seemed quite sincere and appropriately chastened. But the props were strange. Mom sitting in the front row. Business associates and friends gathered somberly as if they were at a funeral. The tough-love hugs at the end. I liked the part where Tiger came home again to his Buddhist upbringing. I took this as a direct slap at Brit Hume of Fox News who suggested recently that if Tiger converted to Christianity all would be forgiven. This is going to be very educational for Brit. What if it turns out people can forgive a Buddhist? Yikes. And really, really…Erin didn’t take an 8-iron to the SUV? Ah, so many questions, so few answers. Tiger doesn’t owe me an apology. He didn’t screw around on me. Golf owes us an apology for using so much land for such a boring activity, as well as for its offenses against fashion.